Students of A Course in Miracles and 4 Habits for Inner Peace have many questions about what these books say and how to apply them in their day-to-day lives. 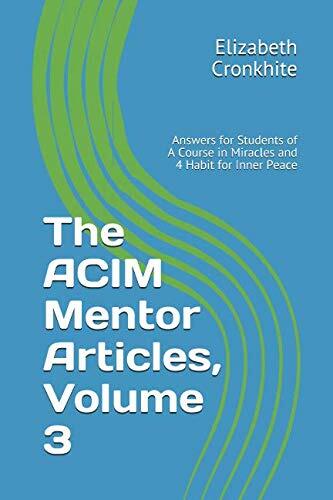 This book is a collection of essays and questions answered by Liz Cronkhite, who, as a spiritual teacher, life coach, and author, guides students in the practical application of spiritual principles in their everyday life.The original ACIM Mentor Articles and its Volume 2, are Liz’s most popular books. They offer practical understanding and advice based on her own experience. Like those articles, those in this book were originally published as a blog and newsletter. This collection of articles from 2015 thru 2018 covers an important stage in Liz’s own spiritual evolution as she came to realize in 2018 that the ego had fallen away in 2014, leaving behind only its “echo”, and resulting in a radical shift in her outer life.